News has always been a big aspect of my life. When I was 3 my mom asked me what I wanted to be when I grew up and I said the name of the morning anchor we watched. Going into my Junior year in the Missouri School of Journalism, I was totally prepared for news to become my entire life. I don’t think I really expected how. With the changes in the industry toward the digital age and the help of my brand new iPhone, I get all of my news content off my phone. Through classes and working in the J-School we have heard that “Everything is digital.” Not having a smart phone until recently really hindered my understanding of how much that is true. Now, I’m the girl who is on her phone from the moment she wakes up. The majority of that time is spent on news Apps of some sort. 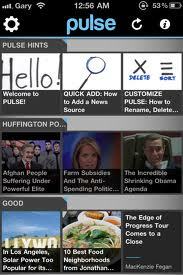 My current favorite App is Pulse. Pulse allows me to look at the headlines from all of my favorite news outlets (Fast Company, Politico, Huffington Post, and many others) all in one place. I am able to compare my favorite sites, get an overview of what’s going on and get easy access to the full articles when I want it. It is the quickest way for me to get the most news very quickly. I could spend days on this App. I’ve been having a really difficult time with my news gathering. I feel like I am doing much better in my work at Newsy than my local news work for Broadcast class. I really need to work on my local skills. My local niche I feel is education. I love doing local education stories. Maybe it’s just been the timing of the huge storm but it seems like every time I need to set something up, school lets out or has an administration day. I am getting so frustrated because I really want to do this story and I feel like I can but it’s just not working out. Then I’m having a hard time moving on from my original idea. It is so difficult for me to get over the obstacles that are thrown at me. I tend to get tripped up and have a hard time finding a new solution. That really needs to be something I need to get over this semester. It is my biggest weakness as a reporter. I’m working on it.